On the rare occasions when, as a child, we were treated to a 'fancy' meal out, the prawn cocktail with spicy sauce was the starter of choice. An avocado was considered glamourous and cosmopolitan, and if my parents were really going for something special on a Friday night, pineapple chicken balls from the local Chinese couldn't be more exotic. How things have changed for children in 2011. Takeaways aren't even a treat anymore in some households and exotic has a whole new meaning. And so an after-school treat for my 8 year old was a trip to Yo Yo Kitchen, near West Acton station. I admit I didn't feel like cooking but didn't want to succumb to a frozen pizza. Plus he giggled at the name 'YoYo' and a tuna roll has been a favourite of his since he first tried sushi at the age of 5. 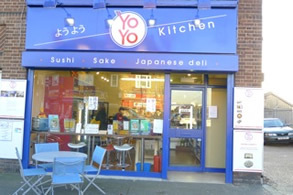 Tucked away in a leafy corner of Acton, in the heart of W3's own 'little Tokyo', Yo Yo Kitchen is a little cafe with a lot to offer. Serving the thriving Japanese community in the area, local commuters and families, chef and owner Yoichi Iguchi, offers all manner of sushi, sashimi, bento boxes and hot meals to take away or heat and eat in at one of the tables. Spotlessly clean and affordable, Yo Yo Kitchen also has a grocery section, with Japanese sweets, rice crackers, books, children's trinkets, ceramic bowls and kitchen utensils. 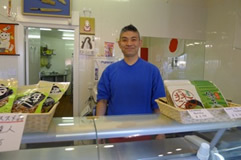 Iguchi, known as 'YoYo', opened his Kitchen nine months ago to be nearer his family and children's school. He has a fine pedigree for a chef - establishing Nobu Tokyo, working in Nobu Park Lane, chief fish buyer for most of the Japanese restaurants in London. His chefs' knives, hanging above the shop counter, are signed by Robert de Niro, Madonna and Nobu himself. Oh and a chef's hat signed by Kylie Minogue - right here in Acton! But back to the sushi. We had the Tuna and Salmon Rolls which is about as adventurous as the kid will get, which was fresh and nothing like the takeaway sushi with its dried out rice that so often disappoints at supermarkets, the YoYo Rolls (the most popular item on the menu) - a mixture of fish with cucumber and avocado, Prawn Gyoza and a Chicken Teriyaki Bento. We heated the chicken teriyaki with rice in a pot at home. For the 8 year old, this was a very special treat for Friday's movie night. For busy families, sushi is an easy way to have something healthy and fresh, and surprisingly affordable. You can park easily nearby and the menu is extensive. As we were leaving another Acton mum came rushing in to buy platter of sushi for her son's 12th birthday party - at his request. 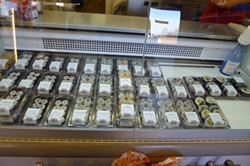 Our takeaway sushi came to just under £15. All the food is prepared daily on the premises. A selection of Japanese beers and soft drinks, as well as some French wine and champagne. Party platters are available.